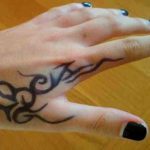 We frequently come across colorful tattoo designs on the net, mostly watercolor ones which look very gorgeous on the skin so we decided to collect the best ones to showcase you. They are defined as popular and artistic with no specific outline. Anyway, it fully depends on the owner whether to have an abstract design which looks more like a painting or a few brush stokes on an simple pattern. If you are looking for ideas to get a colorful tattoo soon, both styles will confidently satisfy your ink itch and everyone will respect the result. Have a look at the ideas showcased below and let us know about your favorite one.